Bluesecrets wrote: I have a question. I am seeing all kinds of entries with backgrounds that are Photoshop-ed in. Is this allowed? I may be wrong (and probably am), but I thought I was remembering some kind of rule about that in the past. Anyway, I am just checking...because well...clarification is clarification. 36 Editing in a relatively neutral background is okay. Remember, though, that we are judging the MOC, and MOCs are best seen when placed against a white or similar background. BTW, just as a reminder to everyone, you are not allowed to use Photoshop to change the actual MOC itself in any way. I have a question. I saw it is allowed to use a bit of landscaping to show the minifigure you wanted to enter. Now I made a creation of a building that was actually meant to showcase the fig, but it turned out kind of nice so I want to enter it in a different category by itself. Is it still allowed to use this MOC to showcase my minifig? As long as I post the building before I do the minifig, right? Edit: And is Medium 640 under the size limit? i think printing presses are considered medieval, since one of the winning entries of the past years' historical categories was the invention of print machine. Elderon wrote: I have a question. I saw it is allowed to use a bit of landscaping to show the minifigure you wanted to enter. Now I made a creation of a building that was actually meant to showcase the fig, but it turned out kind of nice so I want to enter it in a different category by itself. Is it still allowed to use this MOC to showcase my minifig? As long as I post the building before I do the minifig, right? 37 - See answer 28 above. Please don't re-use constructions for more than one entry. 38 - There is a lot of debate among historians on where to make the cutoff for the end of the medieval period, and this also varies a lot based on geography. We've chosen a pretty expansive time period. For various CC activities we have always considered the time period from the fall of the Roman Empire to the Great Fire of London, ~476-1666. Gutenberg invented his printing press in 1440. For the record, though, 'libraries' have existed since ancient times. 39 - We're not going to micromanage your minifig choice. Of course, if you've got a spaceman in your MOC, you probably won't score so well. Glancing through your flickr stream, you certainly have other torso choices to work with that would be less anachronistic. gid617 wrote: Edit: And is Medium 640 under the size limit? each no larger than 800 x 600 pixels in a portrait or landscape orientation. I just submitted an entry into the medieval life category that was a blacksmith shop but then I noticed someone else also submitted a blacksmith shop... Does that mean I have to make a different entry? As far as size, perhaps I should be more specific; if I try to grab the BBCode of a photo, is the number in parenthisis, for example, after Large 1024 it says (544x723), is that the pixel count? 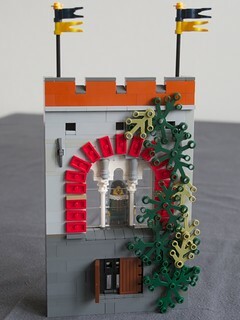 pj_bosman wrote: Can I use the medieval architectural detail (see below) I submitted to that category to make another MOC for another category? Or can I submit only one of the entries, since they feature the same part? 28. An entry can not be submitted to more than one category. You may incorporate the same building technique into individual entries. Daken the Bladesmith wrote: I just submitted an entry into the medieval life category that was a blacksmith shop but then I noticed someone else also submitted a blacksmith shop... Does that mean I have to make a different entry? No. There can be 100 entries of the same kind of building in any category. It would be crazy to only allow one of each type of building in a category. Can I ask that non-admins please not answer questions? The admins run the contest, they have the official word on how things run and all of the other answers can be confusing. Please know that the admins do have lives other than to be on CC 24/7, but they are great guys who WILL answer the questions. It just takes a little patience and waiting to get the answers. 41 - We're not going to micromanage your building choices. It's a fair bet that there will be more than one blacksmith shop in the contest. BTW, check the naughty list, your images are too large. 42 No, yours is fine. What we don't want is for someone to enter a MOC in another category, and then just submit a close-up of one small piece in the architectural details category. We also didn't want people to re-use an entry as a backdrop for another entry. Yours is a separate build, even if it is the exact same design, and therefore it is okay. Bruce N H wrote: 36 Editing in a relatively neutral background is okay. Remember, though, that we are judging the MOC, and MOCs are best seen when placed against a white or similar background. 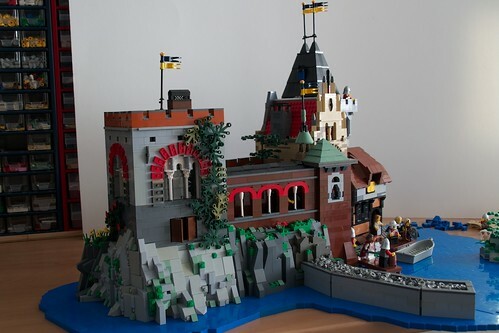 BTW, just as a reminder to everyone, you are not allowed to use Photoshop to change the actual MOC itself in any way. Is this also true for digital entries? because I was planning to add shield, flag, torso decals with PS because LDD doesn't allow me to add the decals on the pieces. For the Winter Scene category, I was going to do a scene from an album cover, I assume this is okay? I didn't know if that would be against the rules/out of taste for not being my idea. It's rather Castle-themed, but I figured I'd check anyways. In the rules it sais no modified LEGO parts, does that also count for LEGO strings? So would I be allowed to cut it to the right lenght?